Constructed from solid pine, this wooden cheeseboard smoothly glides open to reveal four stainless steel cheese tools with wood handles, perfect for serving up artisan cheeses. It's a striking gift for newlyweds, a housewarming, or to commemorate an anniversary. No matter the occasion, it's sure to please any cheese lover. 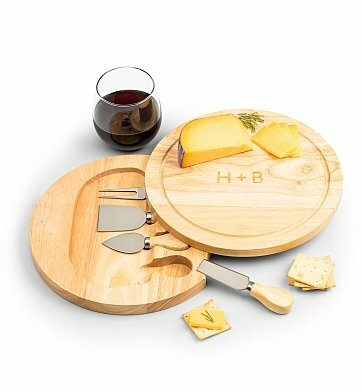 One Solid Swivel Cheese Board with Complimentary Engraving. One Cheese Fork to Hold Cheese in Place While Slicing. One Stilton Spatula, for Shaving Slices off Hard Cheeses. One Cheese Spreader, for Spreading Soft Cheeses. One Cheddar Spatula, for Slicing Semi-Hard Cheeses. Your gift is securely packaged to safeguard the shipping process. A complimentary card with your personal message is included with your gift. Free Engraving! Select two initials to be engraved on the surface of the wooden cheeseboard, along with a contemporary ampersand. Complete the personalization option during checkout. if ordered by 3:30 pm EDT Tuesday April 23rd. Engraved Cheese Board with Tools is a hand delivered gift. These gifts are delivered by one of our local design centers located throughout the United States and Canada. Same day delivery is available for most gifts when ordered before the cutoff time. The cutoff time for Engraved Cheese Board with Tools is 1 PM in the recipient's time zone. Solid pine cheeseboard swivels open to reveal cheese tools. Four stainless steel cheese tools with wooden handles. Complimentary engraving of your chosen initials, with contemporary ampersand.